Yesterday I posted an article titled: How Much Vinegar Does It Take To Clean A Coffee Maker. The short answer depends on how hard your water is and how often you brew coffee. Today I wanted to expand on the frequency side of the equation. How often should you clean a coffee pot with vinegar? The short answer – For simplicity it’s best to just run some vinegar through a brewing cycle once a month or so. You don’t have to think about it and therefore it’s easy to add into your regular cleaning schedule. The long answer – Vinegar is acidic, roughly 5%. When you cut it in water 50/50 then your acidic potency is cut in half but it is still potent enough to damage cheap plastic parts over time and frequent cleanings. If you clean your machine with vinegar too much this can become a problem (although it’s unlikely to become one). This isn’t to say don’t clean your machine very often but because of this I do like to clean my machines slightly less frequently. You really should match your cleaning schedule to your usage if you want to maximize the efficiency of the process. If you use your machine every day then you should clean it more frequently (every month or two). In contrast, occasional use coffee makers don’t have to be cleaned nearly as often. In some cases every year may be acceptable. See this post for more ideas on what to use to clean a coffee maker. Got Minerals In Your Water? Hard water a problem for many households. It is a combination of calcium and magnesium in the water. Hard water by itself can cause a good build up of minerals in your water but even with soft water there are other minerals that can be in your water contributing to TDS and the scalely buildup that forms in your machine (or any surface that contacts the water you use. I found a great TDS chart (see above) over at TDSMeter.com showing the TDS levels of different types of waters. If you don’t know what TDS is it is the total dissolved solids in water. Follow the link for a far more comprehensive description. Many dissolved solids in water contributing to higher levels of TDS include calcium bicarbonate, nitrogen, iron phosphorous, sulfur, as well as other minerals. Even in soft water these dissolved solids can form deposits in your coffee machine and can cause internal parts to perform poorly leading to less than stellar coffee. Additionally some of these deposits can substantially change the flavor of the water and the coffee that water brews. If you have high TDS in your water then you may need to clean your coffee pot and machine a bit more frequently. It will help your machine work better and will make your coffee taste a bit better too. You can estimate your TDS levels using the chart above or with an actual meter like this one. I don’t own one but they seem like a cool thing to have around… you know, if you’re a nerd. In general it’s best to remember that the better quality of water you have and the less often you use your coffee maker the less frequent you have to clean it – every few months is perfectly fine in some situations. 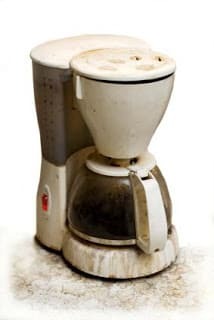 If however you have lower quality water, use your coffee machine daily, or just want the best tasting coffee you can possibly get from your home then you absolutely should be cleaning your coffee maker at least every month if not bit more frequently than that. Some of your best options for regular deep cleaning are listed on this page. For all coffee lovers, having a great cup of freshly brewed coffee makes is the perfect way to start the day. There’s only one thing that could ruin it – a stale cup of coffee. A number of factors can contribute to stale coffee. Scenario 1: You simply forgot it. You brew your coffee early on, pour it in a cup and you go about your daily morning routine. When you return to your coffee, you realized it had gone cold. You try to reheat it. The taste has only gotten worse. You throw it away, but you don’t have time to brew a new batch. You leave the house and try to get a cup of coffee from a nearby café. There’s a full line. You ditched the idea of buying coffee and went your way to work. It turned out that you have a client meeting in an hour and you need to prepare for it. You haven’t had your coffee and it already feels like the whole day will just be as stale as your morning brew. Solution: After you brew your coffee, pour it in an insulated travel mug. This way, you can prepare your coffee early on, do your daily routine and grab the insulated travel mug just before you leave the house. You can enjoy freshly brewed coffee for up to 6 hours. Scenario 2: Your ground coffee beans are no longer fresh. Ground coffee beans have a shelf life. Once you bought ground coffee beans, you need to consume it fast. If you have been using the same batch of ground beans for more three weeks, chances are the taste and flavor of coffee has diminished quality over the weeks. Solution: It’s better if you buy whole coffee beans and get an affordable coffee grinder at home. You can grind beans on demand and ensure that each cup of coffee is fresh. Many drip coffee makers have a built-in grinder. It can be a good investment in your kitchen. Scenario 3: Your coffee maker needs some cleaning. You brew your coffee and pour it in a cup. You added some sugar, like you always do. You start to sip and enjoy it. But there’s something odd about it. The coffee’s aroma is unlike your usual brew. You tasted it and sensed that something’s not right. You thought it was your cup. So you washed it again, wiped it dry and pour in brewed coffee. The stale smell still lingers. It has to be the coffee. It does not taste as fresh as it used to be. Then you realized that the last time you cleaned it thoroughly was a month ago. Yikes! You are already drinking mold, mildew and calcified minerals from the water. Solution: You need to clean your coffee maker regularly. This will ensure that your coffee will taste fresh all the time. The quick answer to this question is clean it after every use. It’s no rocket science. It’s a standard process in every kitchen equipment. Clean every equipment after every use to ensure maximum usage. However, manufacturers suggest that there are two types of cleaning needed to extend the life of your coffee maker. Wash the carafe and the coffee filter after every use. Always follow manufacturers’ instruction whether parts are dishwasher safe or hand wash only. Always check parts of your coffee maker. If you keep coffee maker inside a cupboard, always make sure that all parts are dry to avoid any mold and mildew build up. Regular cleaning of coffee maker will only take you about 5 to 10 minutes. This means putting your coffee maker in a deep cleaning process, which can involve special ingredients and processes. Deep cleaning could take as long as 30 to 45 minutes. When deep cleaning the coffee maker, you can use any of the following natural home ingredients: vinegar, salt, baking soda and denture tablets. Vinegar and salt – Mix water, vinegar and add some salt. Salt is a natural antibacterial. By adding salt, it will help you disinfect the coffee maker especially if mold and mildew had grown in the tube the carries the water from the chamber to the filter. Baking soda – You can also use baking soda when cleaning your coffee maker. The process is similar to using vinegar. Mix baking soda with lukewarm water. Always use lukewarm water to completely dissolve the baking soda. Pour the baking soda solution inside the water chamber. Press the brew button and run a full brewing cycle. Throw away the water. To wash the coffee maker, fill the water chamber with full brewing cycle. Run a full brew. Often, it will take two full brewing cycle to completely wash off the baking soda solution. Denture tablets – Fill the carafe with water. Dissolve 1 or 2 denture tablets. You can use even over-the-counter, generic denture tablets. Pour the denture tablet solution in the water chamber. Run a full brewing cycle. Discard the used water. Fill the water chamber again and run a full brewing cycle to wash off any remaining solution. It often takes just one full clean up brewing cycle to clear up the denture tablet solution.